The vista may look out to a small French fishing port—but, really, this window opens on the future of painting in the twentieth century. 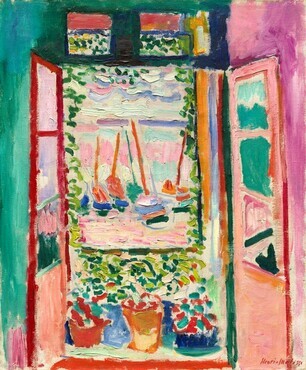 Henri Matisse painted Open Window, Collioure in the summer of 1905, when he and André Derain worked together near the Spanish border. The light-filled scene is vibrant and inviting. 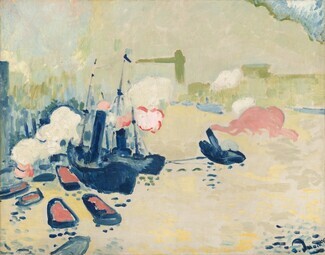 Blue-hulled boats float on pink waves below a sky banded with turquoise, pink, and periwinkle. 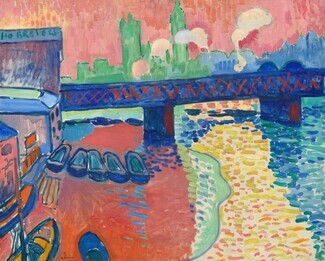 These unnatural colors—Derain would later liken them to “sticks of dynamite”—provoked an outrage that year at the Salon d'Automne in Paris. 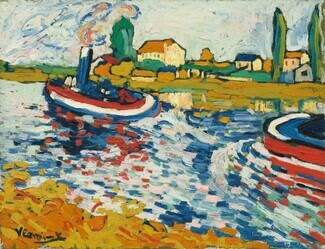 Eyewitness accounts tell of laughter emanating from the room where this painting hung with similarly bold works by Derain, Maurice de Vlaminck, and others. 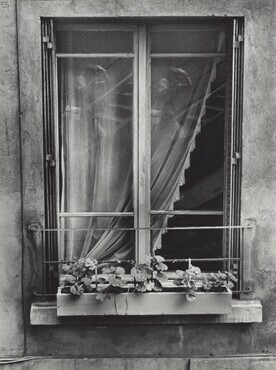 Gertrude Stein, avant-garde writer and collector, reported that some people scratched at the canvases, and a critic, noting the presence of a Renaissance-style statuette in the center of the room, quipped, "Well, well, Donatello among the wild beasts (fauves).” Soon these artists were being called the fauves. The fauves liberated color from any requirements other than those posed by the painting itself. 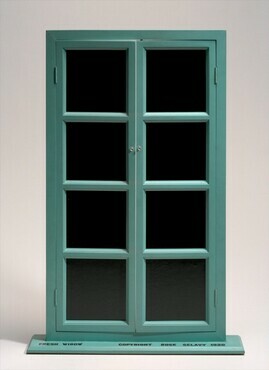 "When I put a green," Matisse would say, "it is not grass. When I put a blue, it is not the sky." Art exerted its own reality. Color was a tool of the painter's artistic intention and expression, uncircumscribed by imitation. 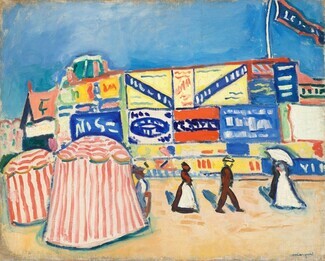 Matisse’s imperative was to "interpret nature and submit it to the spirit of the picture." Note the logic of his colors. They function in complementary pairs—orange-red masts over blue hulls, red blossoms amid green leaves on the wall, opposing reflections of turquoise and pink. Complements such as these become more intense when seen next to each other. Isolated by bare areas of the canvas, the combinations generate a visual vibrato that keeps our eye fixed on the surface. The angled, out-flung doors invite into the scene, but different brushstrokes in each “zone” set up cross-rhythms that impede recession: wide sweeps in the room’s interior, short wavy lines or staccato dabs in the view beyond. Introduced to painting while recovering from appendicitis at age 19, Henri Matisse abandoned his job as a law clerk to compose conventional Dutch-inspired still lifes and interiors using a somber palette. After moving from northern France to Paris in 1891, his colors brightened and his style evolved under the influence of Paul Cézanne, Paul Gauguin, and others. 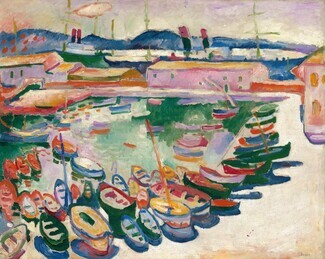 In 1904, while working along the Mediterranean coast, he fully liberated his colors in bold hues that eliminated shadows and defined forms. This experimentation—dubbed fauvism (from “wild beasts”)—was a brief but crucial step in Matisse’s lifelong goal of expression through color. As he traveled throughout North Africa and Moorish Spain from 1906 to 1913, his sense of abstraction heightened, expressed in mural-sized canvases that explored color intensity in relation to human form and studio objects. During the 1920s, Matisse reverted to more conventional modeling, cohesive space, and blended brushwork, depicting figures in exotic costumes in the textile-sheathed interior of his Nice studio. With a commission to design a mural for the Barnes Collection in Philadelphia, however, Matisse reentered the avant-garde fray. Throughout the 1930s, his paintings became more boldly decorative as the illusion of depth was compressed into solid planes of color. This culminated in his return to the cutout technique, which he had first explored in designing costumes and scenery for the Ballets Russes in 1919. By cutting sheets of paper painted with meticulously mixed hues, Matisse “painted with scissors.” These ensembles allowed him to continue creating art despite his failing health once he reached in his early 70s. He also translated these shapes—along with a rekindled love of drawing—to book arts. 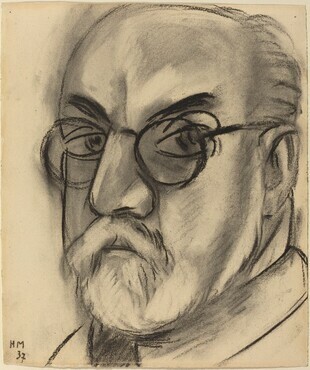 Throughout his life, Matisse published personal artist statements and dedicated at least an hour a day to writing letters to friends and family. These written and visual records illuminate a man consumed by color, fascinated by pattern, and enamored with the act of creation in wide-ranging materials and forms.